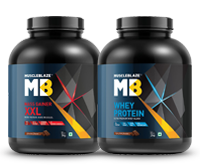 The new reformulated MuscleBlaze Mass Gainer XXL 6.6 lb Chocolate is a mass gain formula that helps you to get big and muscular. 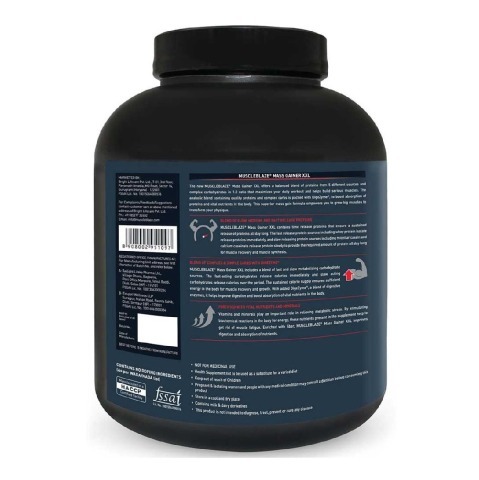 The high-protein blend along with complex carbs in MuscleBlaze Mass Gainer XXL 6.6 lb is powered with digestive enzymes and helps bodybuilding enthusiasts. 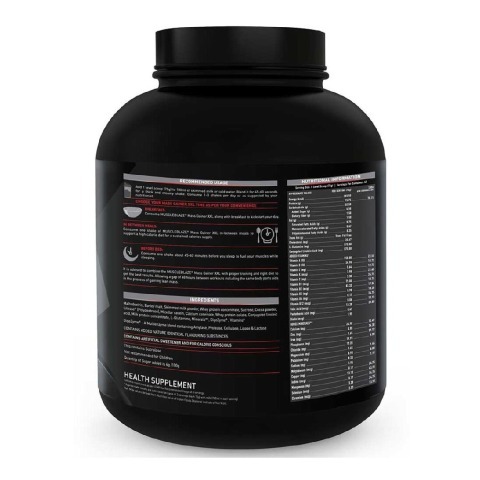 Blended with 6 different protein types, MuscleBlaze Mass Gainer XXL 6.6 lb supplies Essential Amino Acids and Branched Chain Amino Acids to support serious weight training, speed up recovery. 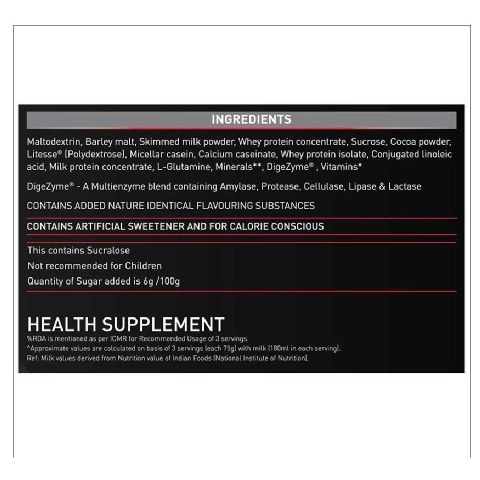 A regular mass gainer provides a bulk of calories from sugar and fat, but the MuscleBlaze Mass Gainer contains only 4.5g sugar in each serving and focuses on complex carbs and high-quality proteins to meet the calorie needs. 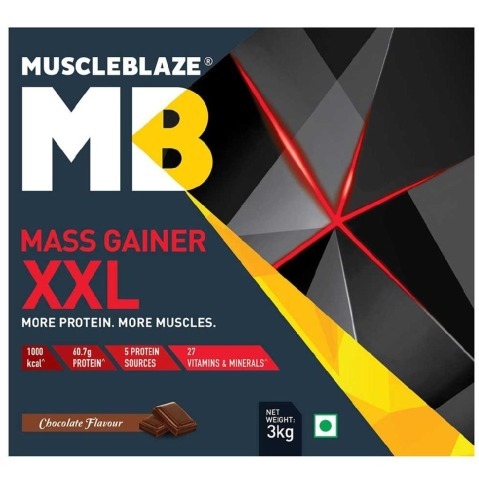 Enriched with digestive enzymes, MuscleBlaze Mass Gainer XXL 6.6 lb Chocolate helps to reduce the likelihood of bloating and aids the bodybuilders to digest and assimilate nutrients for maximum muscle gains and serious weight lifting. Packed with slow medium and fast release proteins MuscleBlaze Mass Gainer XXL 6.6 lb assists in rapid recovery, prevents muscle breakdown and supports serious weight training in bodybuilding enthusiasts. The quickest metabolizing whey hydrolysate and isolate in MuscleBlaze Mass Gainer XXL Chocolate aids to supply nutrients immediately to muscle tissues after an intense workout session and trigger new muscle synthesis. 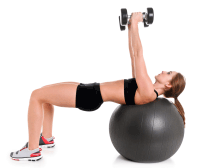 Slow-acting proteins like micellar casein and calcium caseinate keep amino-acids trickling and help the body remain in a positive nitrogen balance. 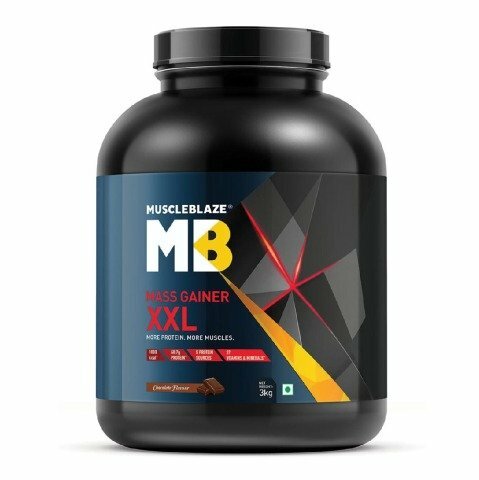 Enriched with vitamins and minerals, MuscleBlaze Mass Gainer XXL 6.6 lb Chocolate aids to relieve energy fatigue so that you may train harder. Add 1 heaping scoops (75g) to 180ml (6 oz) of skimmed milk or cold water. Blend for 45-60 seconds for a thick and creamy shake. Take 1-3 such shakes per day or as suggested by your nutritionist to build mass. 1.What is MuscleBlaze® Mass Gainer XXL? The new MuscleBlaze® Mass Gainer XXL is the mass gain formula which fuels your body with a blend of high-quality time release proteins to provide you a continuous supply of protein all day long. 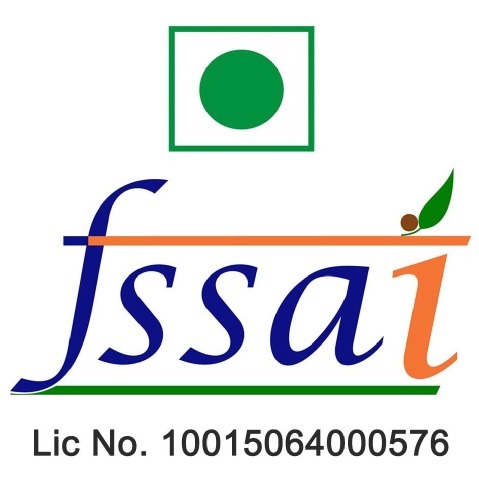 It also contains complex carbohydrates which act as sustained fuel reservoir and prevent the body from using muscles as fuel while recovering from an intense workout. 2.Who should consume MuscleBlaze® Mass Gainer XXL? Bodybuilders who perform heavy-duty workouts to attain lean mass are suggested to consume MuscleBlaze® Mass Gainer XXL as it fuels your body with protein rush and prevents the loss of muscles during recovery. 3.Is it safe for lactose intolerants? No. MuscleBlaze® Mass Gainer XXL contains milk derivatives, thus, not recommended for people who experience lactose intolerance. 4.How is MuscleBlaze Mass Gainer XXL different from previous gainers? 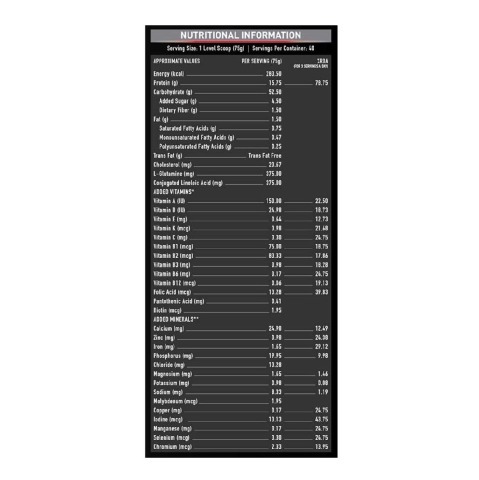 Each serving of Muscle Blaze® Mass Gainer XXL has 4.5g sugar in each serving. 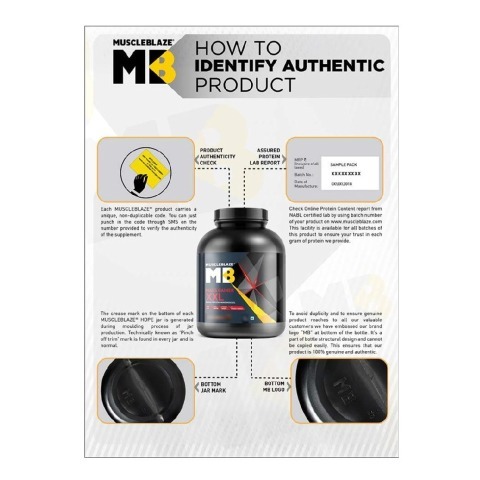 Therefore, the bodybuilding fan is sure that the calories supplied in Muscle Blaze® Mass Gainer XXL come from clean sources, like complex carbs, amino acids other than simple carbs. Enhanced with DigeZyme®, a multi-enzyme digestive complex, MuscleBlaze® Mass Gainer XXL improves absorption of nutrients for muscle gains.